The 10th year of India Foodex took place at the BIEC, Bangalore, India from 31st Aug – 2nd September 2018. It is one of the biggest food industry trade fair of south region focusing food products, retailing, processing & packaging machinery and allied industries and was held alongside other concurrent events including Grain Tech India, DairyTech India and MeatTech Asia to gather visitors from all food industry sectors. 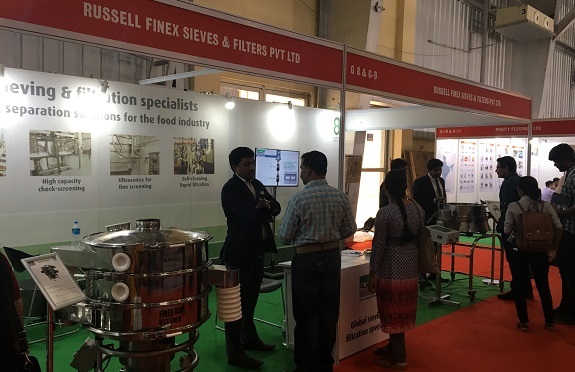 This is another successful year of Russell Finex at India Foodex, located at Stand G8 & G9, Hall No.1A with innovative range of sieving and filtration equipment for the food industry. The Finex Ultima™ is a revolutionary vibro screen, exclusively available for India, Bangladesh and Sri Lanka to deliver high-throughput rate with greater accuracy for wet or dry applications. The unit can be custom-built as per unique requirements and available in different sizes from 30” to 60”. The Russell Compact Sieve®: This versatile vibro sifter is popular in the food industry due to its ability to deliver high-capacity safety screening of powders and liquid slurries, especially where space is restricted. This unit is designed to remove all oversized contamination from food products to increase the value of the product and safeguard the company’s reputation. The Vibrasonic® Deblinding System: This ultrasonic vibro sifter is used to prevent mesh blinding and increase screening capacity for difficult food powders on finer meshes down to 20 microns with more accuracy. The Self-Cleaning Russell Eco Filter®: This industrial self-cleaning filter is designed to accurately removes all contamination from high viscosity food applications such as chocolate, caramel and honey to remove oversize contamination down to 10 microns. Contact us to learn more about the wide range of vibro sifters, vibro screens, ultrasonic deblinding systems and industrial liquid filters available for the food industry.